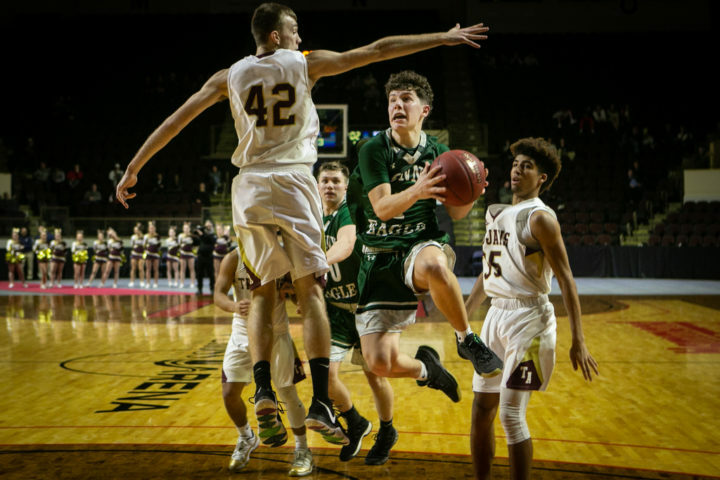 Teams from Caribou, Hampden and Bangor celebrate their respective regional wins in the 2019 high school basketball tournament. 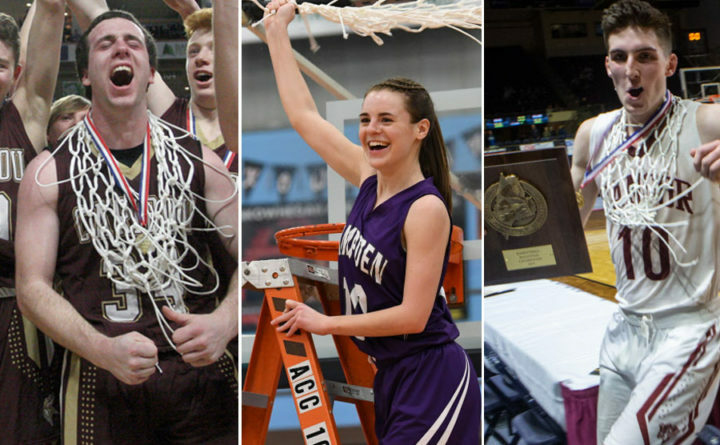 Twenty teams were crowned regional champions over the weekend, and will now move on to fight for the state championship title later this week. 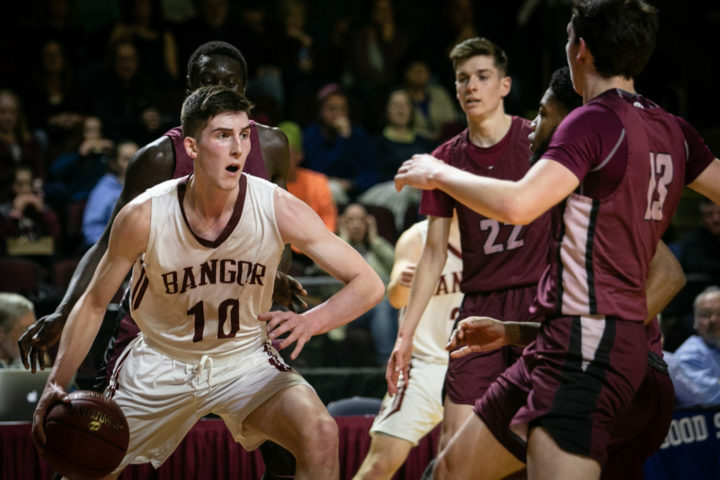 To tide you over until the tournament returns, look back through these photographs from the Bangor Daily News that captured the triumph and heartbreak of the regional finals. 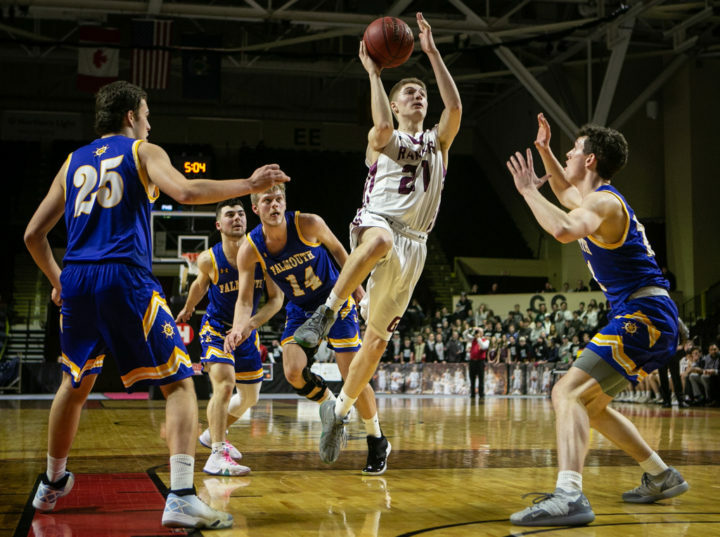 Bangor High School's Matthew Fleming handles the ball in the key during the boys' Class AA North regional championship basketball game in Portland on Friday at the Cross Insurance Arena. 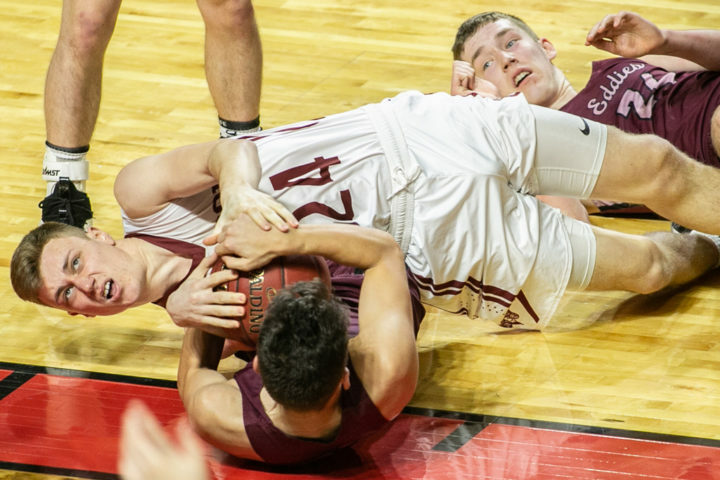 Bangor High School's Jason Smith fights for a loose ball in the boys' Class AA North regional championship basketball game in Portland on Friday at the Cross Insurance Arena. 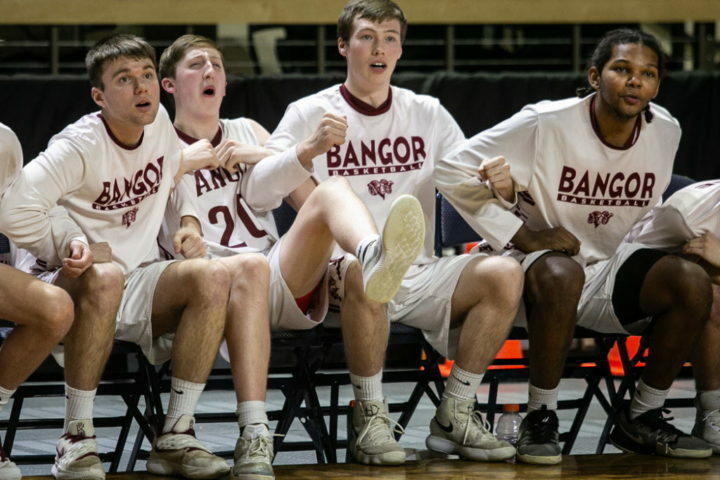 The Bangor High School bench reacts after a missed foul shot in the boys' Class AA North regional championship basketball game in Portland on Friday at the Cross Insurance Arena. 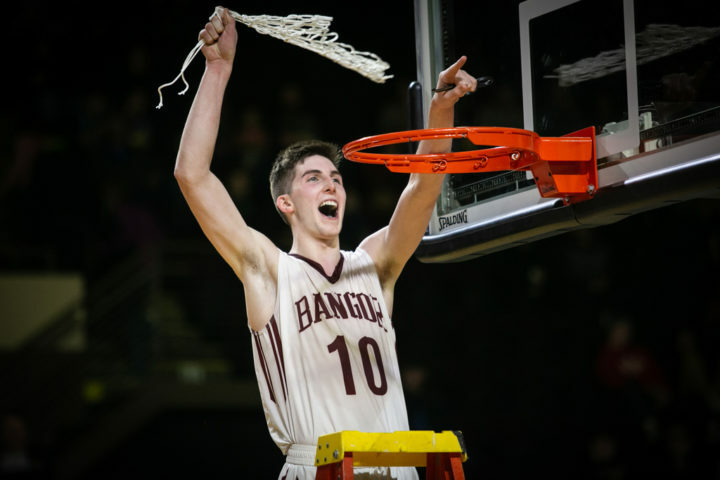 Bangor High School's Matthew Fleming celebrates after winning the boys' Class AA North regional championship basketball game in Portland on Friday at the Cross Insurance Arena. 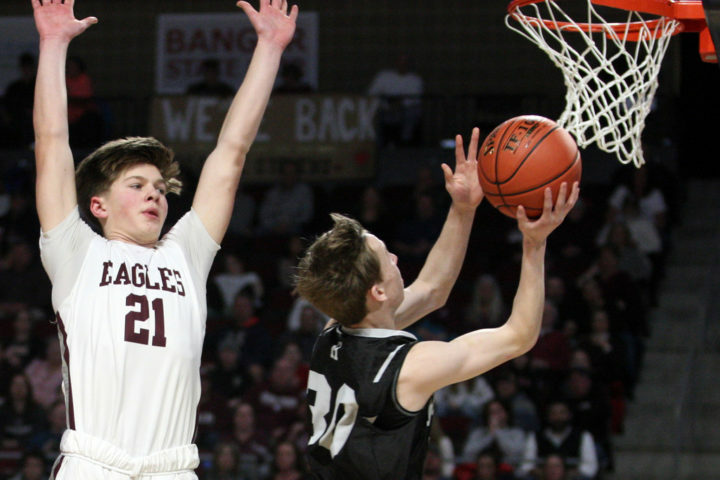 Bonny Eagle High School's Zachary Maturo drives between Thornton Academy's William Chapman (left) and Payton Jones in the boys' Class AA South championship basketball game at the Cross Insurance Arena in Portland on Friday. 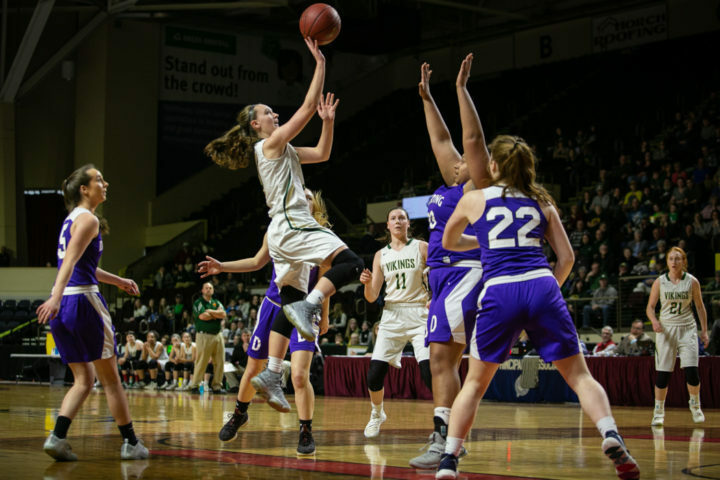 Oxford Hills High School's Cassidy Dumont shoots the ball in the girls' Class AA North regional final basketball game at the Cross Insurance Arena in Portland on Friday. 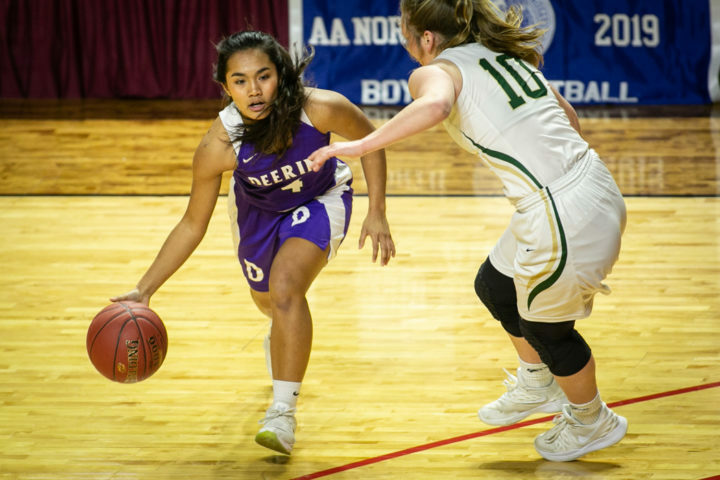 Deering High School's Aviyonna Kim dribbles the ball around Oxford Hill's High School's Cecilia Dieterich in the girls' Class AA North regional final basketball game at the Cross Insurance Arena in Portland on Friday. 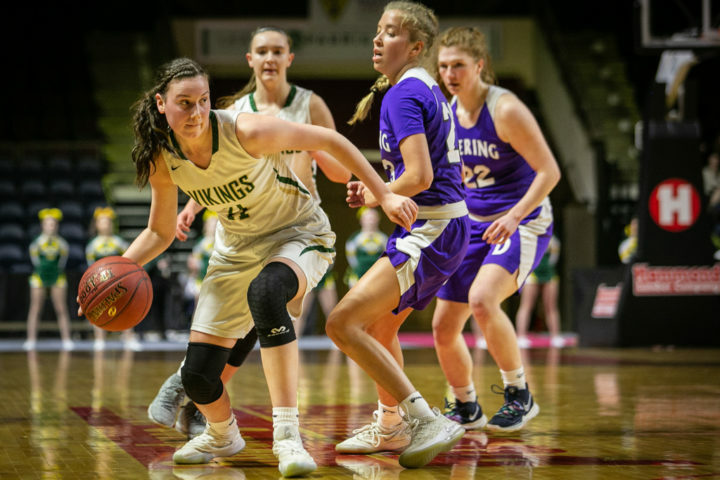 Oxford Hills High School's Margaret Hartnett looks to get the ball around Deering High School's Delaney Haines in the girls' Class AA North regional final basketball game at the Cross Insurance Arena in Portland on Friday. 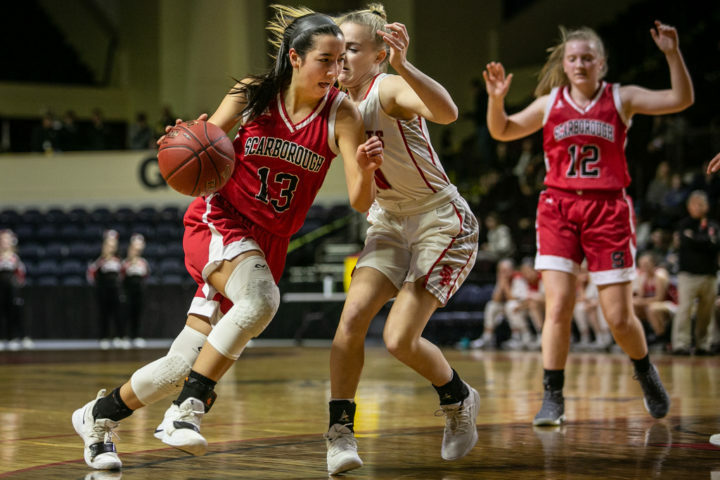 Scarborough High School's Madison Blanche drives around South Portland High School's Maria Degifico in the girls' Class AA South regional championship basketball game in Portland on Friday at the Cross Insurance Arena. 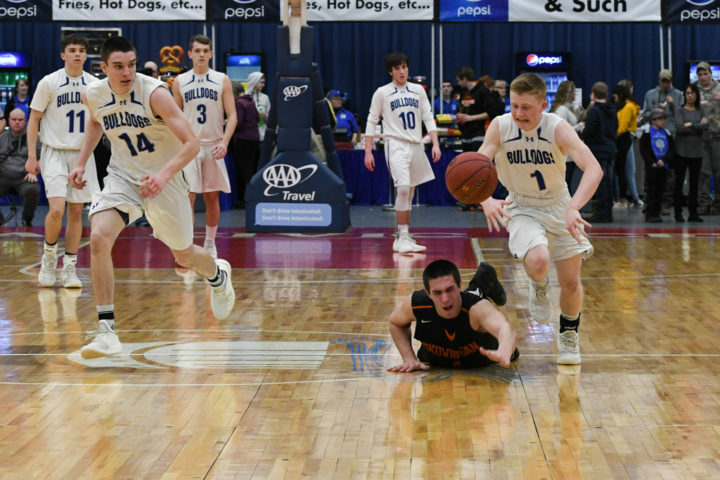 #1 Dylan Coombs of Lawrence beats Marcus Christopher of Skowhegan over a loose ball. Lawrence won the boys' Class A North regional championship. #1 Dylan Coombs of Lawrence. 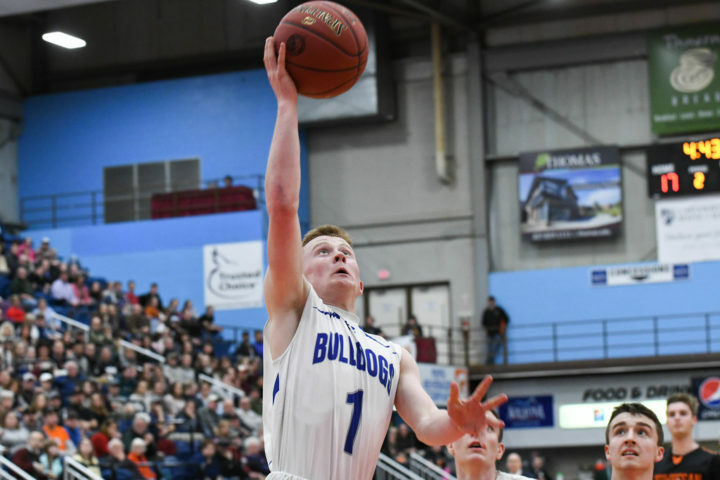 Lawrence won the boys' Class A North regional championship. 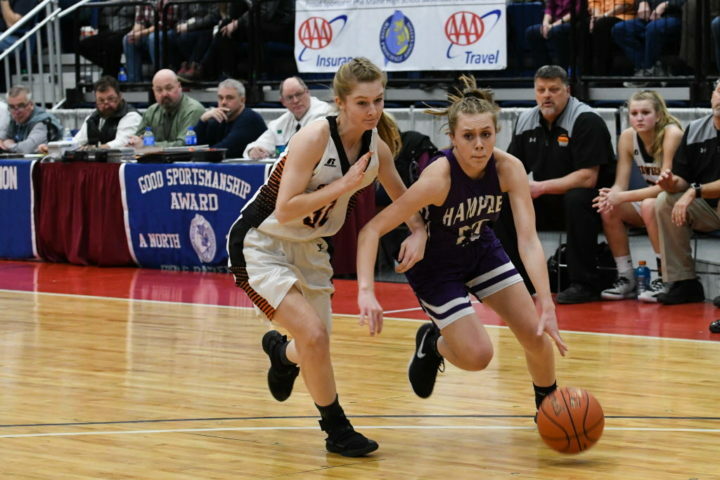 #12 Amelia McLaughlin Hampden Academy vs #32 Sydney Reed of Skowhegan. Hampden won the girls' Class A North regional championship. 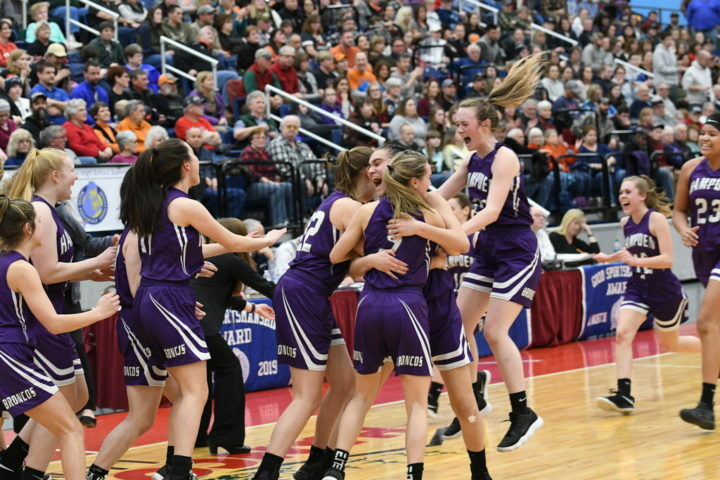 Hampden Academy celebrates the girls' Class A North Championship. 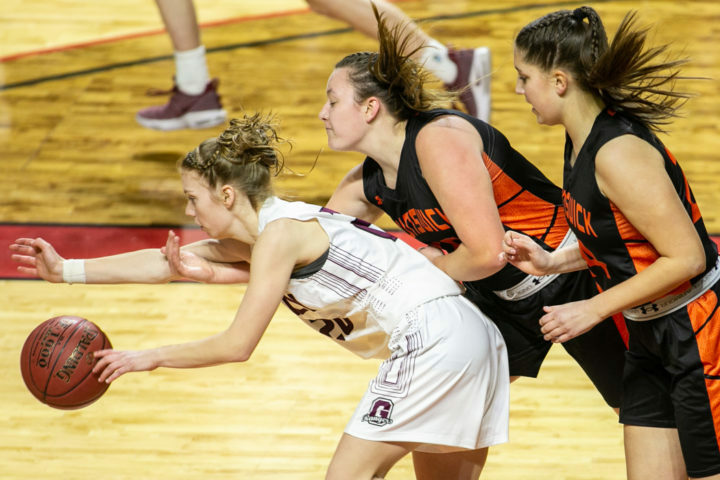 Greely High School's Anna DeWolfe gets the loose ball from two Brunswick High School players in the girls' Class A South regional championship basketball game at the Cross Insurance Arena in Portland on Saturday. 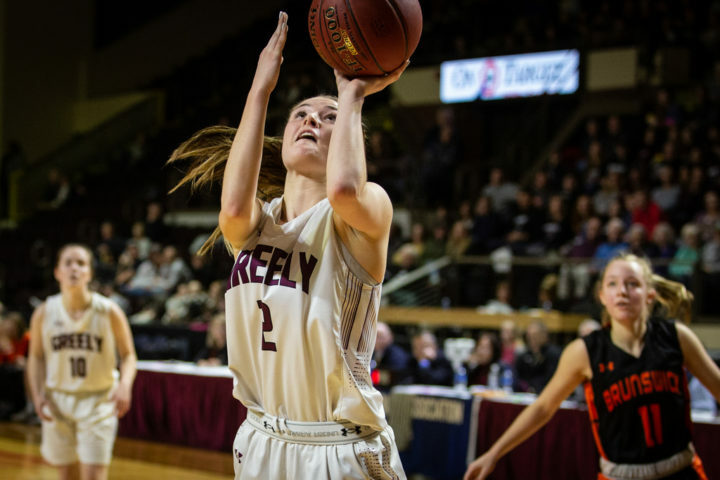 Greely High School's Camille Clement takes a shot in the girls' Class A South regional championship basketball game at the Cross Insurance Arena in Portland on Saturday. 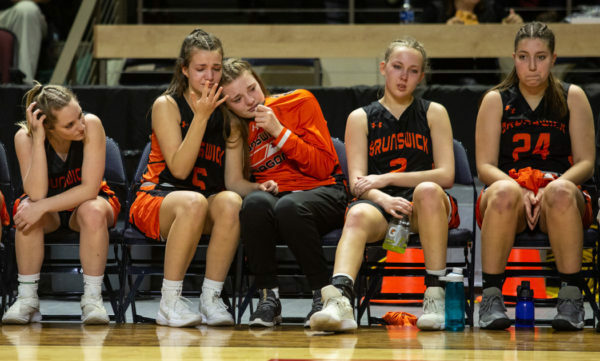 Brunswick High School players react after losing to Greely High School in the girls' Class A South regional championship basketball game at the Cross Insurance Arena in Portland on Saturday. 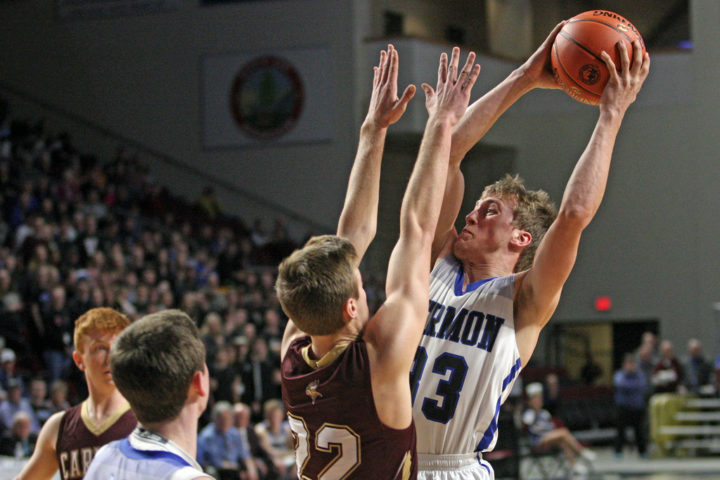 Hermon's Garrett Trask, right, puts up a jumper over the outstretched arms of Caribou's Parker Deprey during Saturday's Class B North championship. 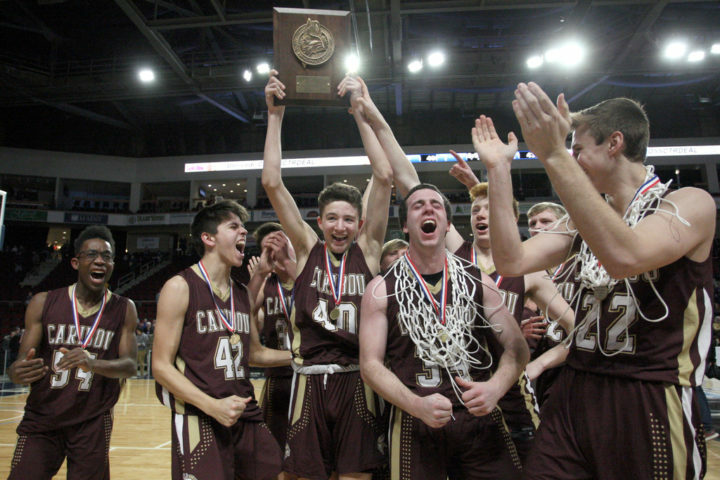 Caribou celebrates a boys' Class B North regional championship win. 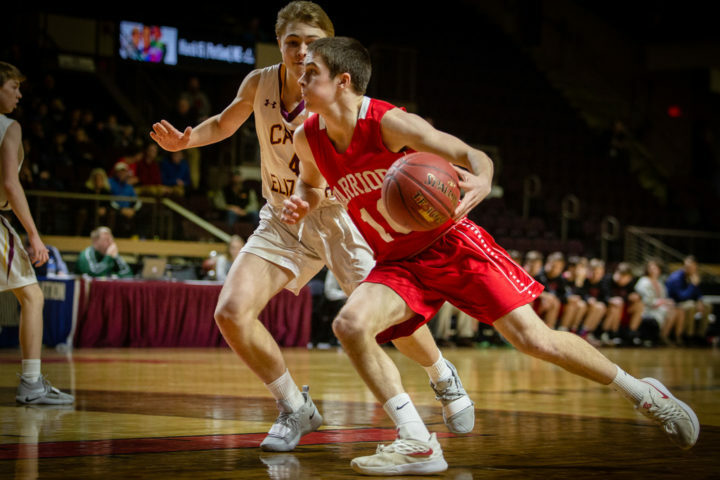 Wells High School's Nate Chandler drives the ball around Cape Elizabeth High School's Quinton Morse in the boys' Class B South regional championship basketball game at the Cross Insurance Arena in Portland on Saturday. 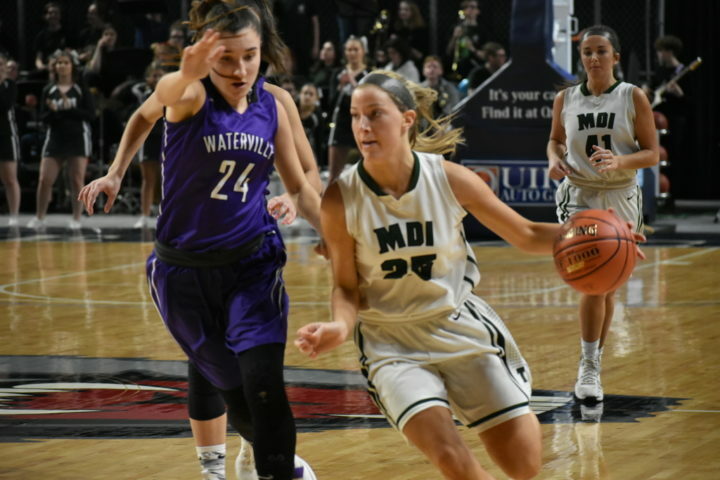 Maddy Candage (25) of Mount Desert Island tries to drive past Waterville's Sadie Garling (24) during Saturday's Class B North girls basketball title game at the Cross Insurance Center in Bangor. 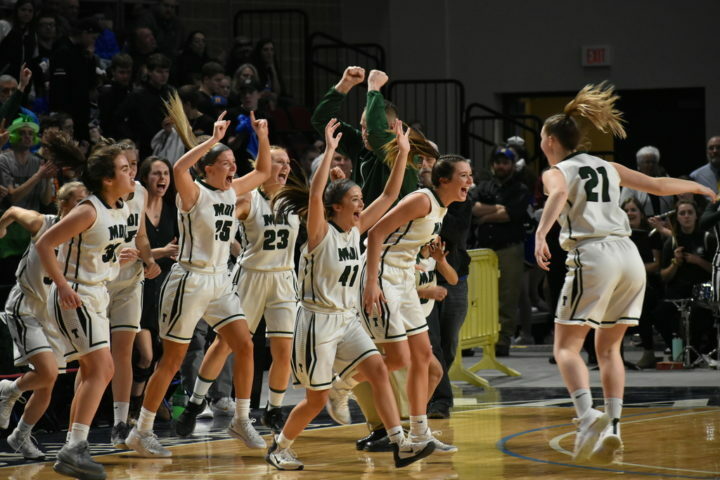 Members of the Mount Desert Island girls basketball team rush the court as the Trojans beat Waterville on Saturday afternoon to win the Class B North championship at the Cross Insurance Center in Bangor. 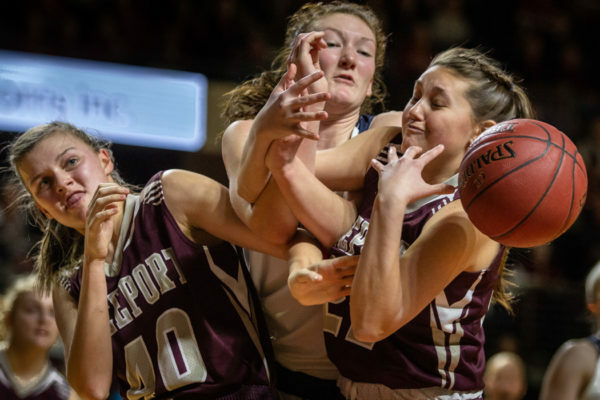 Freeport High School's Rachel Wall (left) and Lindsay Routhier fight for the ball under the hoop with Gray-New Gloucester High School's Jordan Grant in the girls' Class B South regional championship basketball game at the Cross Insurance Arena in Portland on Saturday. 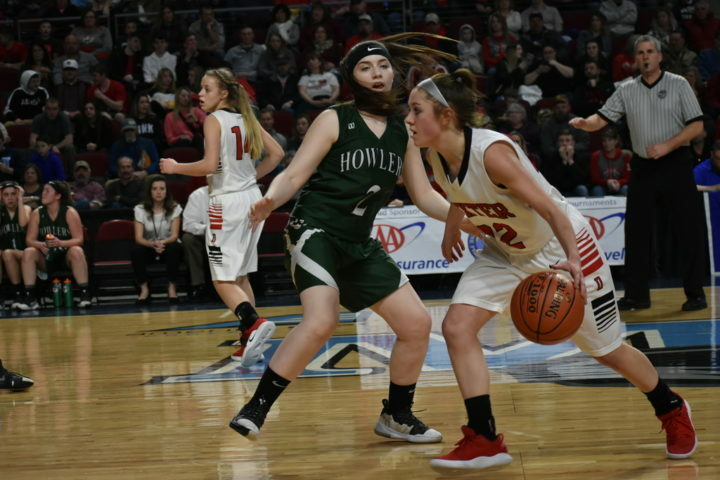 Gray-New Gloucester High School's Jordan Grant drives to the hoop while guarded by Freeport High School's Rachel Wall in the girls' Class B South regional championship basketball game at the Cross Insurance Arena in Portland on Saturday. 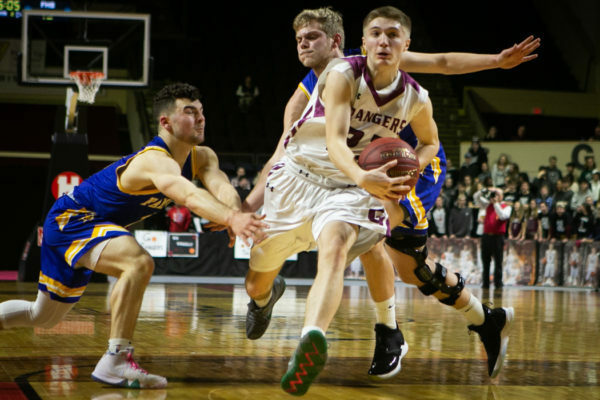 Houlton's Jaron Gentle, right, goes around George Stevens Academy's Andrew Szwez during Saturday night's Class C North championship. 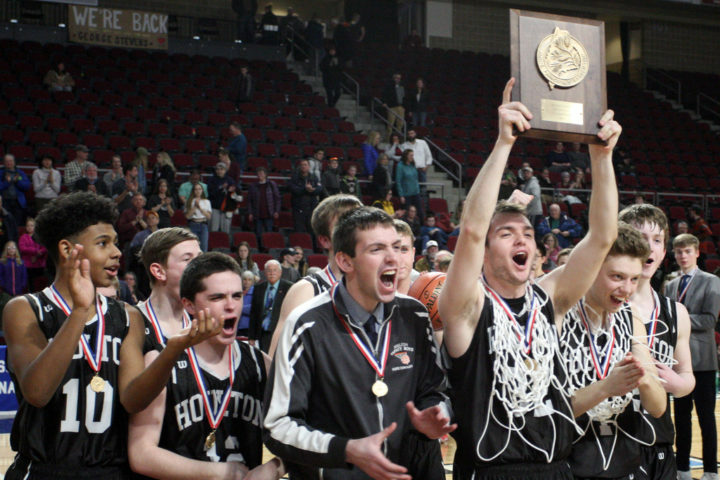 Members of the Houlton boys basketball team hoist the Class C North championship plaque following their 43-34 victory over George Stevens Academy Saturday. 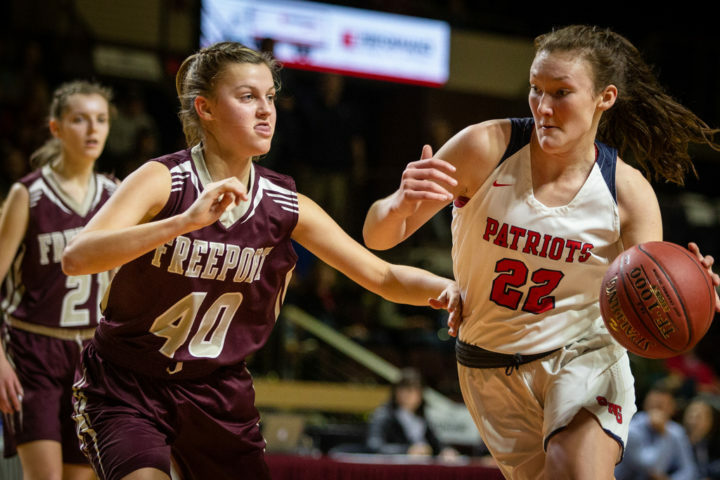 Kaylee Deering (right) of Dexter maneuvers around Laney Harding of Penobscot Valley during Friday's Class C North girls title game in Bangor. 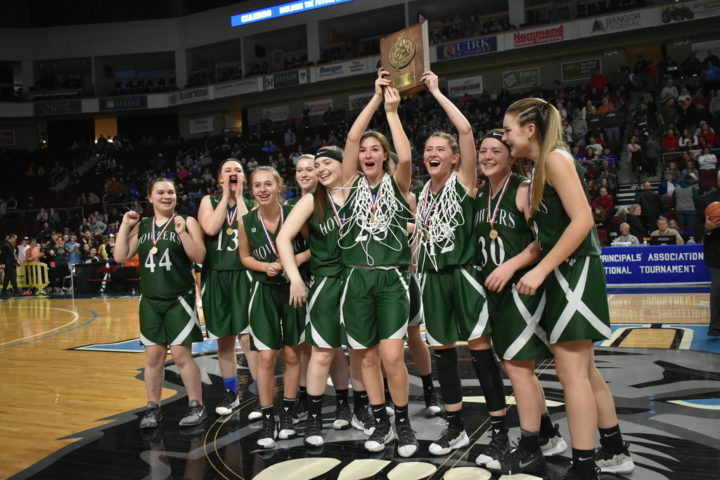 The Penobscot Valley High School girls' basketball team celebrates after winning the Class C North regional championship. 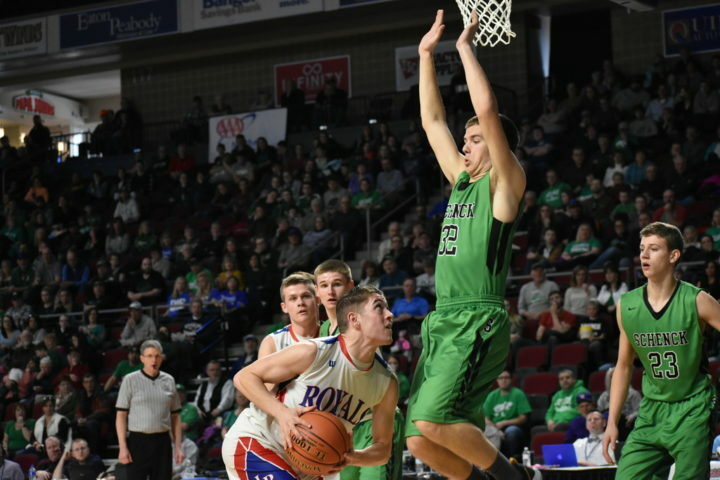 Ryan Alley of Jonesport-Beals fakes Schenck's Travis Thompson into the air under the basket during Saturday's Class D North basketball championship game at the Cross Insurance Center in Bangor. 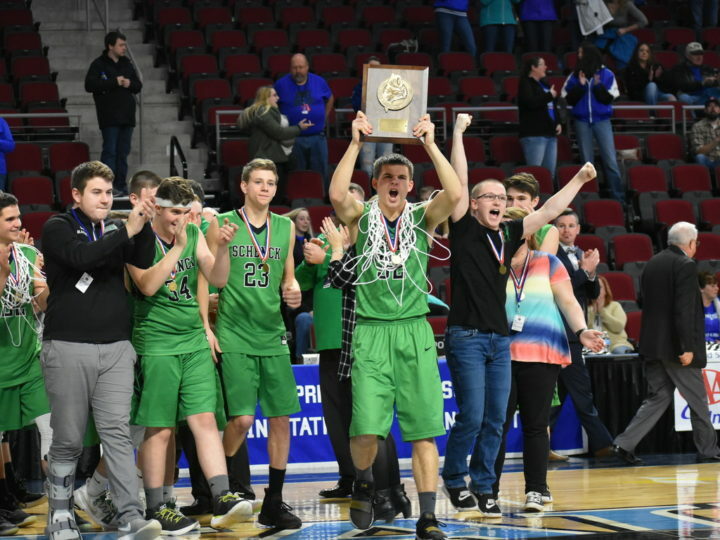 Travis Thompson hoists the Class D North championship plaque as the Wolverines celebrate Saturday's 70-47 win over Jonesport-Beals at the Cross Insurance Center in Bangor. 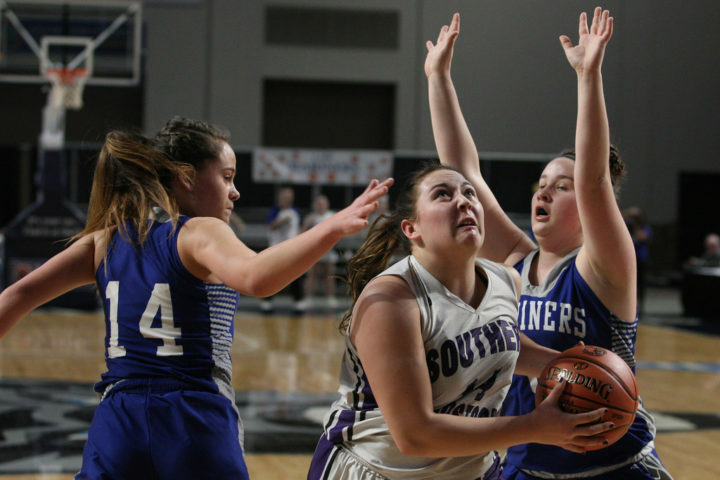 Southern Aroostook's Kacy Daggett, center, takes the ball strong to the hoop in the first half of Saturday morning's Class D North championship. Defending for Deer Isle-Stonington's Katie Hutchinson, left, and Taylor Hardy. 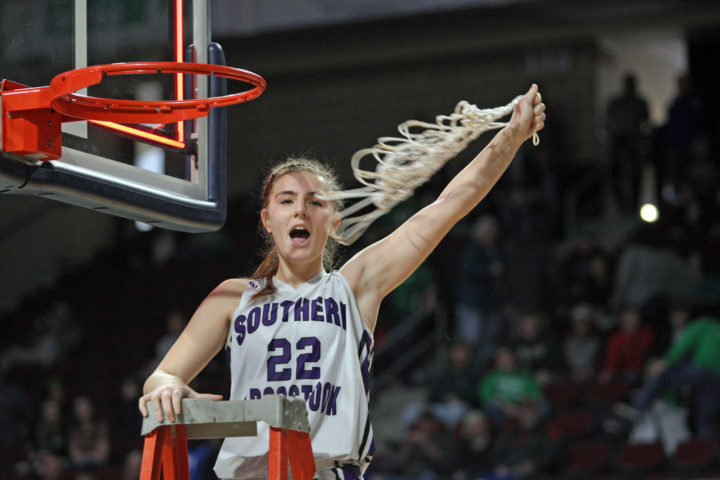 Southern Aroostook's Sydney Brewer twirls the net in jubilation following the Warriors 62-49 victory over Deer Isle-Stonignton.